Many marketers want to reach specific audiences, such as email subscribers or website visitors, through advertising on social media. Facebook allows you to do just that, and in this post we explain how to advertise to and use custom audiences on Facebook to your advantage. In Facebook Ads Manager are two options for targeting your audiences: custom and lookalike. Once we’ve discussed how to set them up, we walk through how to use them in Facebook advertising, as well as how to interpret Audience Insights. 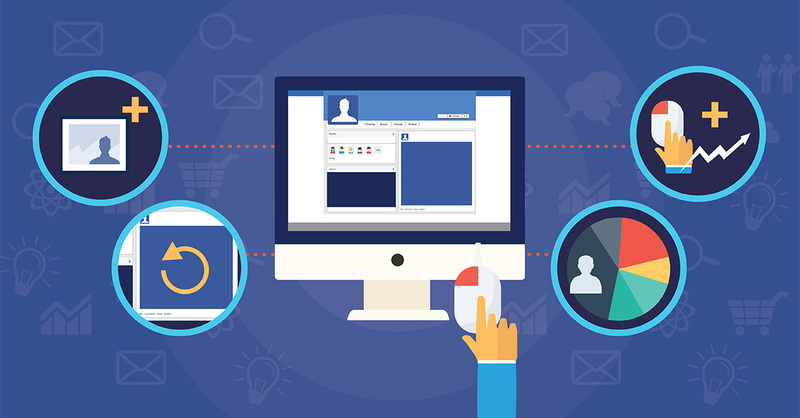 For small-business owners and marketers who aren’t familiar with how to effectively advertise on Facebook, this article walks you through the process, step by step. Facebook Ads allows you to create Custom Audiences so you can target ads using email addresses, website visitors, and app users. To see exactly how powerful and targeted you can make Custom Audiences on Facebook, you can read about this marketer's experiment, in which he targeted his roommate with extremely personal ads. While the experiment pushed the boundaries with his roommate, it teaches valuable lessons about Facebook Custom Audience ad targeting. To start, go to your Facebook Ads Manager. Click on the Tools drop down menu and then the Audiences link. On the Audiences screen, you’ll have the option to create a Custom Audience, a Lookalike Audience, or a Saved Audience. Select Custom Audience. You have three options to create your Custom Audience: using a customer list, website traffic, or app activity. Most businesses use the customer list and website traffic options, and those with mobile apps will be able to use app activity. All of these options give you the ability to use Facebook Ads for a higher return on investment. Here is a more detailed look at each of the options and how to set them up. Select the Customer List option to upload a file, copy and paste a list, or import contacts from your email marketing platform. Use this option to advertise to a wide range of people connected to your business, such as current customers, former customers, leads, email subscribers, email contacts, and other professional connections. You can upload or copy and paste lists with emails, phone numbers, Facebook user IDs, and mobile advertiser IDs to create your Custom Audience. For most businesses, email and phone number lists are the easiest to obtain. Facebook user IDs must be obtained from your mobile apps using steps outlined on Facebook. Mobile advertiser IDs are managed by Apple or Android Advertising Networks; you can learn more about them on Facebook, too. Your current customer database for emails and phone numbers. Your leads for emails and phone numbers. Your email list or newsletter subscribers. Your LinkedIn connections for emails. Business cards you’ve collected from conferences and other business networking events. Any professional connections that include email addresses or phone numbers. Remember: Facebook has specific Terms of Service in regards to the data you upload for your Custom Audiences. In short, you must collect emails and phone numbers with permission from the users. Don’t buy lists of emails and contact information. After you submit your lists of emails and phone numbers, Facebook will search for any profiles that use them. Depending on the list size that you upload, this could take anywhere from a few minutes to a few hours. While it searches, you can give your Custom Audience a name and finish your setup. Once Facebook is finished searching, you’ll see a notification that your new Custom Audience is ready to use. Now you can start using your Custom Audience in your ad campaigns. After Customer List, the next most common type of Custom Audience is Website Traffic, which you can use to target your website visitors: anyone who visits your website, people who visit specific web pages, people who visit specific webpages but not others, and people who haven't visited your website in a certain amount of time. This advertising approach is also known as retargeting. Once you configure your details, click on the settings wheel icon at the bottom left of the box to get your Pixel Code. Follow the directions to put this script on your website. 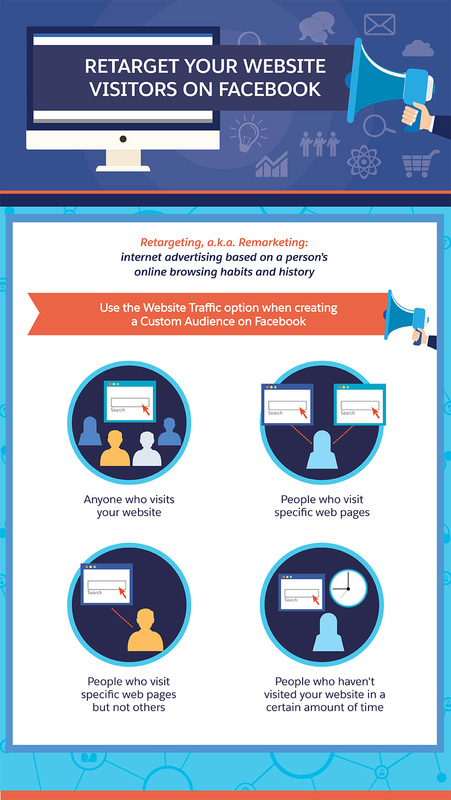 Facebook will then begin to collect information about your website visitors, as defined for this Custom Audience. If you have a mobile app, you can use the App Activity option to create a Custom Audience from your app users. When you select this option, you must agree to the Terms of Service. You will then be taken through the setup to define the type of Custom Audience you want to create. Once you configure the specific type of audience you want to advertise to for your mobile app, Facebook collects those users. After you set up your specific Custom Audiences, you can create Lookalike Audiences. For example, if you create a Custom Audience using your customer list, your Lookalike Audience will target ads to similar users on Facebook and reach more people who are likely to be interested in your products and services. To create a Lookalike Audience, choose a source to model it after, such as one of your Custom Audiences, or one of your Facebook pages. The latter option creates a Lookalike Audience modeling your Facebook fans. Choose a country and size range for your audience: The smaller the range, the more targeted it will be. Well-targeted audiences are less expensive and more effective. When you create an ad through the Facebook Ads Manager, you can select your Custom and Lookalike Audiences, or choose to include or exclude them, in the audience targeting section. If you boost a post from your Facebook page, you can choose your Custom and Lookalike Audiences by selecting the People you choose through targeting option. This option allows you to use the Boost Post option from your page with a highly targeted audience each time you choose to increase engagement for your page posts. It's a much more effective approach than boosting your posts to a non-targeted audience. Audience Insights is a feature under the Tools menu drop down in Facebook Ads Manager that allows you to learn more about the audiences you created, as well as about your page’s fans. When you visit this page, you can look at information about everyone on Facebook, people connected to your page, and your Custom Audiences. If you want to analyze a Custom or Lookalike Audience, you can select one or more in the top left sidebar under Custom Audience. Analyze your Facebook page fans, too. Select one or more in the bottom left sidebar under People Connected To. Depending on the size of the audience you select, you will see information related to their demographics, lifestyle, likes, activity, and more. You can use this information to create custom audiences for other social networking advertising platforms, such as Twitter, LinkedIn, and Pinterest. Soon you will be able to advertise to audiences similar to your customers, email subscribers, and others connected to your business across all social platforms. This information is also invaluable in helping you create buyer personas that you can use in all your marketing efforts, such as your content marketing. You could even use it to find other websites and businesses that your customers are connected to in order to establish referral network. Custom Audiences allow you to go beyond standard ad targeting on Facebook. With them you can target ads towards specific audiences that will be most interested in your business and the products or services you advertise. Better targeting means better ROI and a healthier profit margin.